Being influenced by the FOMC protocols, the weak durable goods report and PMI composite index for Markit, USD has lost its momentum and it is not showing any signs of strength. 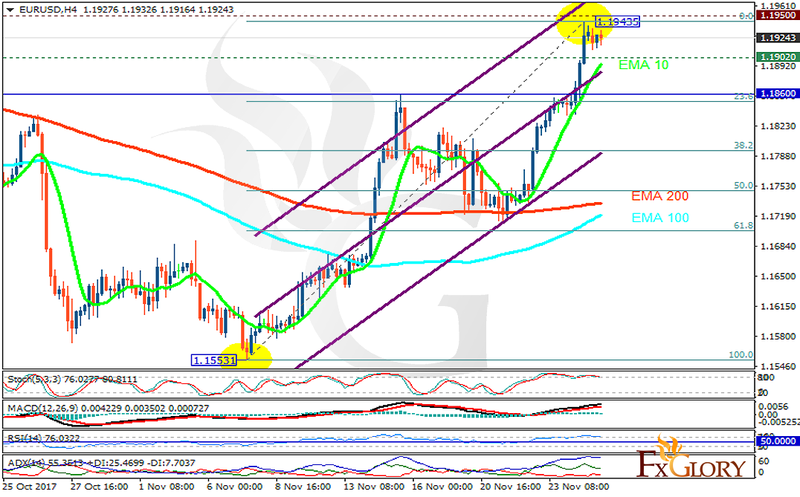 The support rests at 1.19020 with resistance at 1.19500 which both lines are above the weekly pivot point at 1.18600. The EMA of 10 is moving with bullish bias in the ascendant channel and it is above the EMA of 200 and the EMA of 100. The RSI is moving in overbought area, the Stochastic is moving in high ranges and the MACD line is above the signal line in the positive territory. The ADX is showing buy signals. There is a high possibility of correction pattern towards 61.8 level of Fibonacci, however, long positions are recommended towards 1.20.